For your safety, the automatic transaxle has a shift lock system which prevents shifting the transaxle from P (Park) or N (Neutral) into R (Reverse) unless the brake pedal is depressed. 2. Start the engine or turn the ignition switch to the ON position to R.
3. 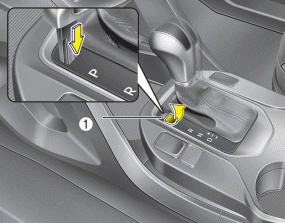 Move the shift lever to R.
Always fully depress the brake pedal before and while shifting out of the P (Park) position into another position to avoid inadvertent motion of the vehicle which could injure persons in or around the vehicle. 1. Carefully remove the cap covering the shift-lock override access hole.